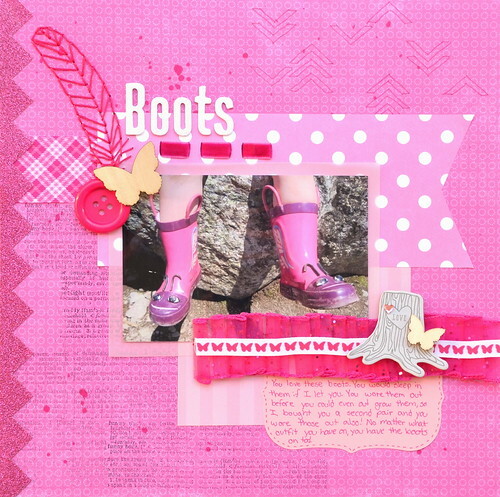 I have been wanting to scrapbook my daughter's butterfly boots from the moment I gave them to her. She would have worn these to bed if I let her! She never wanted to wear anything else on her feet and totally worn them out and I ended up getting her a second pair, which also wore out before she could outgrow them. I made this layout for The Memory Nest's monochromatic challenge. Since my daughter's boots are mostly pink, I picked pink for the challenge. I actually really don't like the color pink, but I somehow have an awful lot of pink papers and embellishments to work with. I had a lot of fun stamping away on the background and sewing the feather. 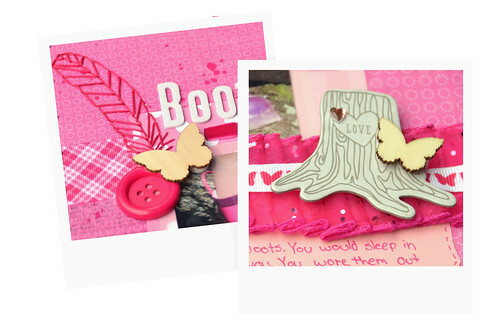 I also added some cute wood butterflies. I'm going to "steal" your idea with that sewed feather - it's so beautiful little detail and gives nice texture to your layout!